In 1988, Dade "Zero Cool" Murphy (age 11) is arrested and charged with crashing 1,507 systems in one day and causing a single-day 7-point drop in the New York Stock Exchange. Upon conviction, he is banned from owning or operating computers or touch-tone telephones until his 18th birthday. Shortly before Dade (Jonny Lee Miller) turns 18, his mother (now divorced) takes a job in New York City. Upon turning 18, Dade calls a local television station, dupes the security guard into giving him the modem's phone number (a tactic known as social engineering) and successfully hacks into the station's computer network, changing the current TV program to an episode of The Outer Limits. However, Dade is "attacked" by a hacker (handle "Acid Burn") on the same network. During the conversation, Dade identifies himself by the new alias, Crash Override. Dade enrolls at Stanton High School, where he meets Kate Libby (Angelina Jolie), who is assigned to take him on a tour of the school. After Dade learns that Kate is "Acid Burn", a feud erupts between them. 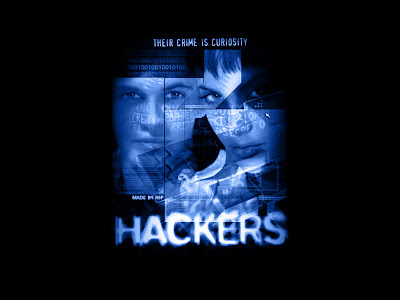 The real trouble begins when Joey Pardella (Jesse Bradford), the novice hacker of the group, successfully breaks into an Ellingson Mineral Company supercomputer to prove to the rest of the group that he is an elite hacker. To validate this feat, he downloads part of a garbage file. Unfortunately, the company's IT employee Hal (Penn Jillette) detects this unauthorized entry and summons computer security officer Eugene "The Plague" Belford (Fisher Stevens) to deal with the problem. He realizes the file being downloaded can prove that The Plague is stealing from the company via salami slicing. The Plague enlists the U.S. Secret Service to recover the file by claiming that it is the code to Da Vinci, a computer virus that will capsize the company's oil tanker fleet and he needs that code to destroy the virus.